This article by Prof. Blagoje Govedarica was published in Oslobodjenje on the 4th of April 2009. Prof. Govedarica teaches archaeology of South-East Europe at the Institute for Prehistory and Protohistory in Heidelberg University, he is Editor of the Annals of the Centre for Balkan Studies and member of the Academy of Sciences and Arts of Bosnia and Herzegovina. 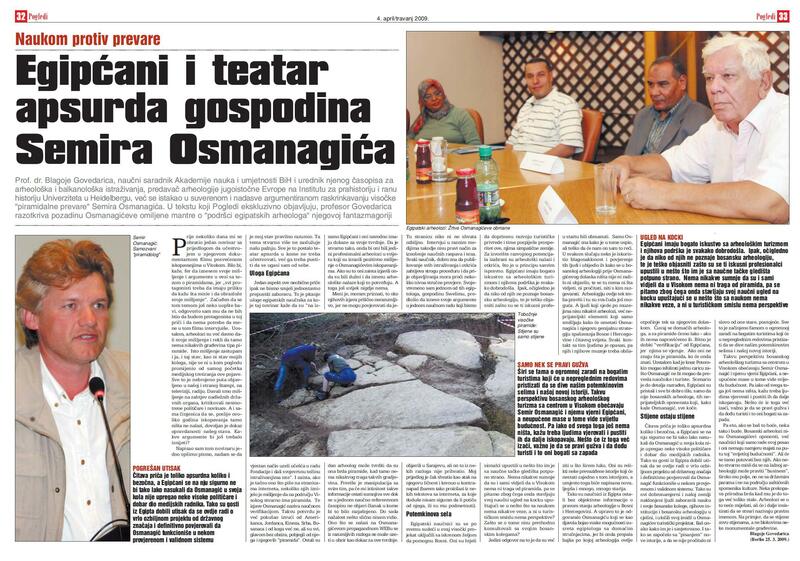 A few days ago, a journalist suggested to me that I take part in a documentary about the excavations at Visoko. 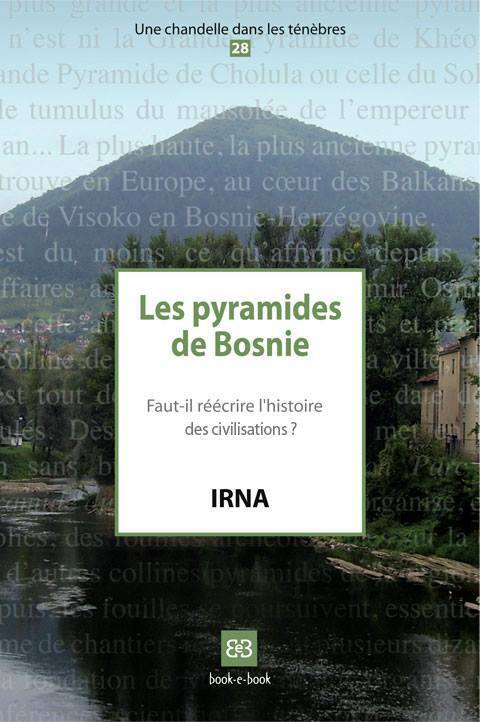 He said it would be in the interests of fairness to let me present my ideas and arguments about the Bosnian pyramids theory, because "every protagonist should have the opportunity to express their views and explain their ideas". Rather taken aback that there was still someone interested in this subject, I told him that I had no desire to play any part in this story, and that there was no need to include an interview with me in this film. For one thing, archaeologists have been saying for a long time now that there is nothing that would lead them to conclude that there is any pyramid construction of any kind at Visoko. I share my colleagues’ opinion, and, ever since the day when the media first displayed an interest in this phenomenon, neither their, nor my, position has changed one whit. The same view has been expressed countless times already, both in the domestic and foreign press, and on television and radio. We have given our opinion when requested by responsible state institutions; we have criticized incautious journalists and politicians. And the simple fact that so many years of excavation have still failed to unearth anything of importance is surely sufficient proof that we were right. So what else is there that could possibly be worth saying? I wrote a detailed letter to the journalist, and I hope that I made my position quite clear . This topic really doesn’t deserve our attention any more. The whole thing has turned into a theatre of the absurd in which it is best that we take no part; rather, we should stand back, and let it sputter out by itself. Yet there is one aspect of this unusual story that should not be allowed to slide into oblivion. It is the question of the part played by the Egyptian scientists, who, according to the journalist, had "taken part in the work of the Foundation and given particular weight to the excavations". And, if what is written on the relevant web pages is accurate, some of them have indeed expressed the opinion that there actually are pyramids in the region of Visoko. Osmanagic calls these statements scientific verification. He has at various times made previous attempts to obtain similar confirmations from Americans, Jordanians, Chinese, Serbs, Bosnians, and anyone else he could think of: but all of them were only too anxious to distance themselves as quickly as possible from both him and his "pyramids". The only ones to stick by him were the Egyptians, who were said to be in possession of proof to back up the various claims. If this were really so, they would be the only professional archaeologists on the planet to express a positive view of Osmanagic’s excavations. And, if they had actually made these statements, then they should, of course, also have presented the archaeological discoveries that would confirm them. Yet, so far, nothing of the kind has ever seen the light of day. I must admit that I find such statements impossible to understand, because I cannot believe that any archaeologist can claim that these hills are pyramids when there is absolutely no trace of any such construction to be found there. There has been altogether too much jiggery pokery in this business, and the veracity of such claims will, in my opinion, remain in question until the day when a relevant paper in a scientific peer reviewed journal is published, and the various assertions confirmed and explained. So far, regrettably, I have seen nothing of the kind. For reasons that need no explanation, what is published on Osmanagic’s propaganda website cannot be considered as proof of such assertions. Those web pages cannot possibly be taken seriously – and, moreover, press and television interviews are not the way in which scientific theses should be presented. Every scientist knows that, before any new piece of research or new discovery can be published, it must undergo rigorous procedures, and various stages of scientific validation. I did once suggest to one of the Egyptologists, Mr. Swelim, that he should present his arguments in a scientific work that we would publish in Sarajevo, but, for reasons unknown, he did not accept this proposal. He even seemed to take umbrage at my suggestion, treating it as if it were a personal attack, and even subsequently launched his own counter-attack (at least, that is how it appears on some internet sites, although I do not know whether the articles in question are actually his own work, or simply carry his signature). It would appear that the Egyptian scientists allied themselves with the project in Visoko because of a genuine desire to help Bosnia, to help develop its tourism industry, and so contribute to the economy of a country of which many Egyptians think very highly: and, of course, archaeological discoveries could potentially form an important element of this development. The Egyptians have a vast experience of archaeological tourism, and their support would be welcome anyway. However, it is only too clear that none of these Egyptian academics has a detailed knowledge of Bosnian archaeology, and it is difficult to explain why these experienced professionals have become involved in a project that, from the scientific point of view, is entirely alien to them. They have made site visits to Visoko, and thus can be in no doubt about there not being the slightest trace of any pyramid there. One can only wonder, therefore, what led them to jeopardise their academic reputations by getting involved in a project that was not only bereft of any shred of scientific validity, but also lacked any really solid basis for the promotion of tourism, Why did they not consult their Bosnian colleagues about the matter beforehand? The only answer to these questions is that, from the very outset, the Egyptian academics were duped. Only Osmanagic knows how he pulled this off, and he is not about to reveal the details. What is clear is that the goodwill and trust of these people was ruthlessly exploited, and they were led to believe that, prior to the arrival of Osmanagic, Bosnian archaeology as an academic field hardly existed. There were no excavations to see, no publications to read, and no one to talk to about the subject. Bosnian archaeology was therefore very much an unknown quantity, the tip of an iceberg below whose surface undreamed-of wonders might be lurking. The people who work in museums were not archaeologists, but hostile elements conspiring to hinder Osmanagic and his brilliant strategy for saving Bosnia and Herzegovina and the entire world. Any contact with such people was dangerous, and they and their museums were therefore best kept well away. Relics of an outdated history, they would disappear when that history was itself eventually displaced by another history yet to be written, a revised history infinitely more compelling and far, far older. At the end of the day, therefore, the Egyptian scientists were never given any objective information about the real state of archaeology in Bosnia-Herzegovina. This, of course, was part of Osmanagic’s plan, as he lived in mortal fear of the prospect of any meeting between the Egyptologists and local experts. Had that happened, the version of events according to which Bosnian archaeology began only with Osmanagic’s own arrival in the country would have completely collapsed. “Beware of local archaeologists, and, as for the pyramids, no problem: if none can be found, we’ll just manufacture some of our own.” The important thing was to get a "verification" from the Egyptians, because of their credibility. If Egyptians do not know what a pyramid is, who does? After all, if Prince Potemkin was able to deceive an Empress with fake villages, why could Osmanagic not fool scientists and tourists with fake pyramids? The scenario was planned in detail, the Egyptians played along, and everything would have gone swimmingly had it not been for the Bosnian archaeologists, those hostile opponents who, as Osmanagic says, get in everyone’s way. The absurdity of this whole story is equalled only by its outrageousness. The Egyptians would surely never have gone along with it in the way that they did if Osmanagic had not succeeded in harnessing a few senior politicians and a large part of the media to his chariot. Because of the hype, the Egyptian visitors were led to believe that this was a very serious project of national importance, and that there were no grounds for believing that Osmanagic was operating in anything other than a wholly genuine and valid manner. Thus, perfectly decent people who were well disposed towards Bosnia have done exactly what they were told, closed their eyes and ears to the claims of science, their Bosnian colleagues, the country’s institutions and the entire corpus of Bosnian archaeology, and have hitched their reputations to the bandwagon of Osmanagic’s tourist enterprise. Without a single word of the existing history having been read, the "writing" of a new history has thus begun. The whole undertaking, moreover, is seasoned with the myth of the huge profits to be drawn from rich tourists who will come in countless droves to marvel at our Potemkin villages and our new history. So Semir Osmanagic and his loyal Egyptians have created the prospect and promise of a Bosnian archaeological tourism industry centred on Visoko, and the ignorant masses see in this the light of the future. Even if nothing of any significance has yet been brought to light, we are told to carry on believing in these people, and to let them continue to excavate. Something will eventually come of it; the important thing is that crowds of people keep turning up, and that there is a constant stream of tourists, preferably Western ones, as it is they who have the best-lined pockets. Well, if this is really what people want, so be it. Bosnian archaeologists are not Osmanagic’s opponents, but scientists who are doing their job, and their agenda does not include blocking the path to this "light of the future." But it is a path that will be trodden without them. If anyone really thinks that "business" can be done on the basis of bogus archaeology, then let them have carte blanche: but not with public money, and not on the site of protected cultural monuments. Let them continue to dig on a natural hill, if that is what they want to do. Archaeologists will not interfere, but they will continue to insist that things be called by their real names: for instance, that stones continue to be called stones, and not blocks from some monumental construction. Below is the original text in Bosnian, and two letters, published on the Foundation website, sent by Dr. Swelim after the publication of this article, one to Oslobodjenje redaction and the other to Prof. Govedarica himself.